A 3D-printed model of the Stratospheric Observatory for Infrared Astronomy (SOFIA) sits on display beneath a photo of the real thing. You can now 3D-print your own miniature version of NASA's flying telescope, the Stratospheric Observatory for Infrared Astronomy (SOFIA). 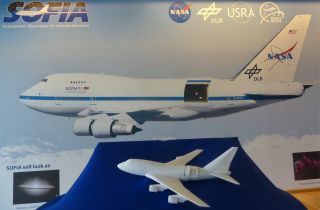 Engineers at NASA's Ames Research Center in California have created an eight-piece model of the airborne observatory, and the digital files needed to 3D-print your own tiny SOFIA are free to download here. "SOFIA flies higher than commercial jetliners to get above 99 percent of the water vapor in Earth's atmosphere, which blocks infrared light from reaching the ground," NASA officials said in a description of the 3D-printing files. "This is why SOFIA is capable of making observations that are impossible for even the largest and highest ground-based telescopes." Researchers with NASA and the German space agency, which is known by its German acronym, DLR, have used SOFIA to study stars, planets, comets, black holes and more. The telescope has found atomic oxygen on Mars, watched the dwarf planet Pluto pass in front of a distant star to learn about its atmosphere, and became the first airborne observatory to study distant exoplanets. The 3D-printed model of the Stratospheric Observatory for Infrared Astronomy (SOFIA) . This 3D-printable version of SOFIA is built to a scale of 1/200 and is just under a foot long. It includes a miniaturized version of SOFIA's 106-inch (2.7 meters) reflecting telescope, which is situated at the rear of the aircraft behind a door that can be either open or closed. The fuselage can also be opened to reveal details of the inside of the aircraft.